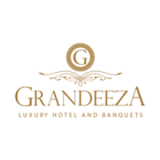 Grandeeza Luxury Hotel and Banquets opened in 2015 is a brand new property. We are proud to have one of the largest banquet halls in Sri Lanka, which can also be split in to three ballrooms. The full ballroom can accommodate up to 1,400 theatre style (subject to table and floor plan). Our colossal Grand Ballroom entrance cannot be missed and a seperate hotel lobby entrance is available for room guests and diners. Grandeeza Hotel is a place for relaxation and indulgence, located just 10 minutes from the Bandaranaike International Airport and 30 minutes from Colombo (on the Colombo – Katunayake highway) facing the gorgeous Negombo lagoon. We are the national winner of Best luxury Architecture Design Hotel and Regional winner of Best Banquet/Event Hotel 2017. We invite you to experience the warmth of our hospitality and discover the true spirit of Grandeeza Hotel.